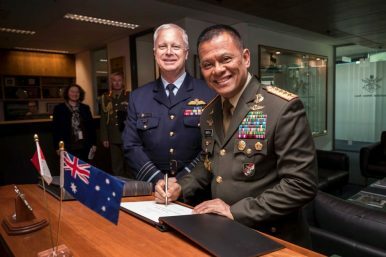 An Indonesia-Australia defense meeting between Air Chief Marshal Mark Binskin and General Gatot Nurmantyo in Canberra. The two nations co-hosted a counterterrorism meeting last week in Manado. What Did the New Asia Terrorism Meeting in Indonesia Achieve? The engagement reflected growing alarm about the terrorism threat and ongoing subregional cooperation to combat it. On July 29, ministers and senior officials from Australia, Brunei, Indonesia, Malaysia, New Zealand, and the Philippines met for a subregional meeting to discuss cross-border terrorism and foreign terrorist fighters. The convening of the meeting reflected both the growing alarm in Asia about the terrorism threat as well as the ongoing subregional cooperation underway to combat it. As I have noted previously, though the Middle East has been the focus in the military campaign against the twin strongholds of the Islamic State (ISIS) in Iraq and Syria, Southeast Asia is another front where the group has been making inroads, particularly as it has lost ground elsewhere (See: “ASEAN’s Islamic State Conundrum”). Apart from propaganda efforts and a string of planned attacks directed at ASEAN states, fears that the group could be looking to establish a territorial foothold in the subregion have only risen with the ongoing siege in the southern Philippine city of Marawi, which began back in May. That heightened threat perception has further catalyzed already ongoing cooperation among regional states. Some of this has taken the form of trilateral cooperation among the three Southeast Asian states most directly affected: Indonesia, Malaysia, and the Philippines. The three countries officially announced the start of trilateral patrols in the Sulu-Sulawesi Seas on June 19, which they had been mulling for around a year (See: “Confronting Threats in the Sulu-Sulawesi Seas: Opportunities and Challenges“). And their diplomatic and security officials also held a meeting on June 22 to discuss the terror threat. But there have also been other forms of subregional cooperation involving Asian states more broadly. One good example of this is the collaboration being jointly facilitated by Indonesia and Australia, which had co-hosted a meeting on counterterrorism and terrorism financing last August (See: “Why Do Australia-Indonesia Military Relations Matter”). Last week saw the convening of another ministerial level subregional meeting to address the challenge. The meeting, dubbed the Subregional Meeting on Foreign Terrorist Fighters and Cross Border Terrorism, was effectively a follow-up meeting to the one co-hosted by Jakarta and Canberra last year. The latest subregional meeting was co-hosted by Indonesian Coordinating Minister for Political, Legal, and Security Affairs Wiranto and Australian Attorney General Senator George Brandis QC. The focus, Indonesian foreign ministry officials had said ahead of the meeting, was on developing and coordinating responses to threats posed by foreign fighters and cross-border terrorism more generally. During the meeting, the ministers discussed a wide range of issues, which reflected both the complex nature of the threat and the need for a coordinated approach not only within governments, but in concert with the private sector and civil society. These included enhancing law enforcement cooperation and intelligence sharing; managing terrorist offenders in prisons; addressing the root causes of terrorism through countering violent extremism (CVE) programs; and ensuring a greater understanding of legal frameworks in the subregion. There were also several tangible achievements at the meeting as well. For instance, the ministers agreed to establish a Foreign Terrorist Fighters Strategic Forum to enhance information-sharing about foreign terrorist fighters and cross border movements among both law enforcement and intelligence agencies, including by using existing databases and/or establishing new ones. They also agreed to both hold a sub-regional best practice roundtable on the management of terrorist offenders both in prisons and post-release as well as to undertake a comparative study of their terrorism laws, which are at times drastically different. The challenges to accomplishing all this are well known, and they are tied to deep-seated issues from lingering inter-state distrust to corruption to different institutional cultures among the security services. How this subregional meeting and the collaboration under its umbrella will evolve thus remains to be seen. For their part, the ministers did agree to establish a working group of senior officials to follow up and review implementation of initiatives, and they also said they would convene another iteration of the meeting in 2018. With the terrorism threat showing few signs of ebbing anytime soon, this will no doubt remain an interesting space to watch. What’s Next for the New Sulu Sea Trilateral Patrols?ASEAN Defense Meeting Puts Terrorism in the SpotlightWhen Will Trilateral Patrols in the Sulu Sea Begin?Mahathir-Duterte Summit Puts Malaysia-Philippines Ties Into FocusWhat’s Next for the Sulu Sea Trilateral Patrols?